This track ramps down from the Beta brainwave state, getting the user to 7.83Hz by the 6 minute mark. While at the 7.83Hz mark, which is Schumann Resonance, the Earth’s resonant frequency, the track rotates through the Solfeggio scale. This track can be used for meditation or just simply played in the background, providing benefits. The nine-toned Solfeggio Frequencies made up the ancient tonal scale of chants and sacred music. Three groups of three mathematical, geometric and frequency matrices create the scale. 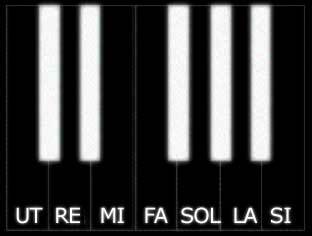 The 12-tone scale used in most music replaced the Solfeggio scale sometime during the papacy of Pope Gregory I (590 to 604 CE). Starting at the 3 minute mark the carrier frequency ascends up the Solfeggio scale until it hits 963, then goes back to 528 ,then 174 to finish up by the 35 minute mark. This is a grounding, meditative track with Ancient healing frequency carriers. Will help to clear and calm the mind, relax the user, dissolve emotional tension, uplift the spirit, provide insight, healing, well-being. You may find it useful for many other things. You may also notice heightened intuition, ESP or other psychic phenomenon becoming heightened in addition to profound spirituality. This is a session which ramps down to the Schumann Resonance frequency, or 7.83 Hz. Research done with Zen meditators shows that 7.83 is a significant frequency, and other research indicates that stimulating the Schumann frequency results in more blood flow in the brain than any other frequency. Use this session in a quiet, comfortable place, free of distraction, in a chair or lying down. After starting the session, close your eyes and relax. This session can be used with or without headphones. If you are in a noisy environment, it is recommended to use headphones.